Just in time for Fourth of July holiday celebrations, major construction work on the project was completed in June. 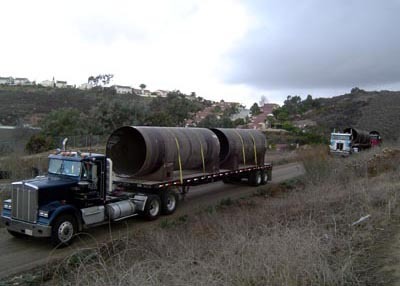 Thank you for your patience as the Water Authority rehabilitated 4.3 miles of 66- and 69-inch diameter pipes, extending the pipeline's service life by several decades and helping ensure continued water system reliability. 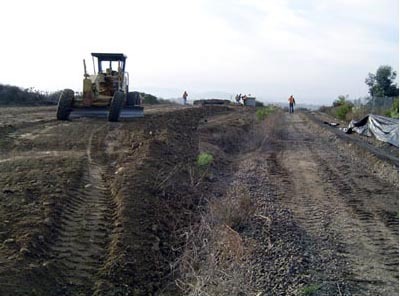 The timely success of the project underscores the value of collaboration by the Water Authority's project team; public agency stakeholders such as the city of La Mesa and Helix Water District; and the contractor, L.H. Woods & Sons, Inc. The Water Authority began work in September 2017 to reline a regional wholesale water pipeline, which will extend its service life by 75 years or more. 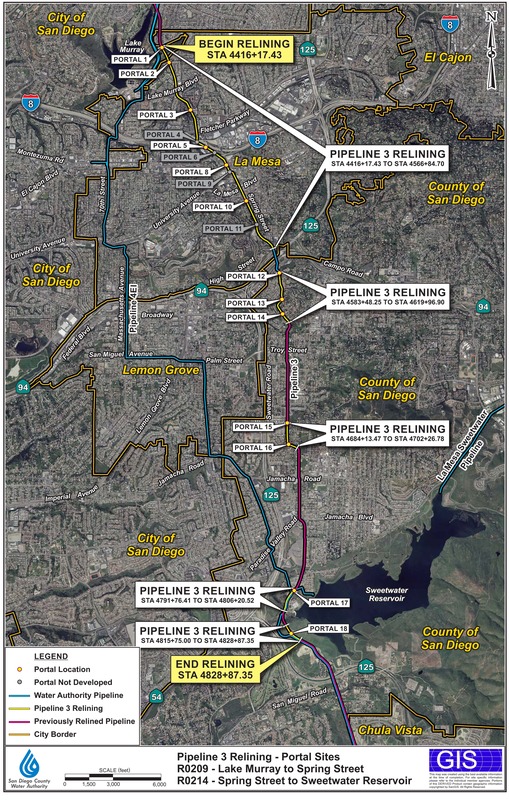 The pipeline traverses the western portion of San Diego County from the Riverside County border to Sweetwater Reservoir. The section of relined pipeline extends from Lake Murray in the north to Sweetwater Reservoir in the south. 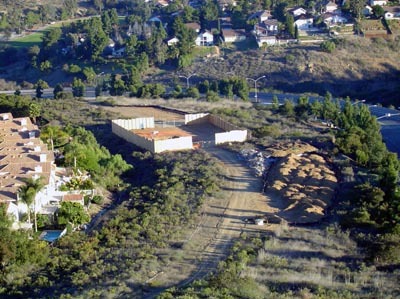 It serves the Helix Water District and Sweetwater Authority and traverses portions of Baltimore Drive and Spring Street in La Mesa and the unincorporated communities of Spring Valley and La Presa. A total of 4.3 miles of pipeline was relined. Major construction activities ended in June 2018. Monday through Saturday, 7 a.m. to 7 p.m.
Water-Authority-Pipeline-Relining-Process from San Diego County Water Authority on Vimeo. 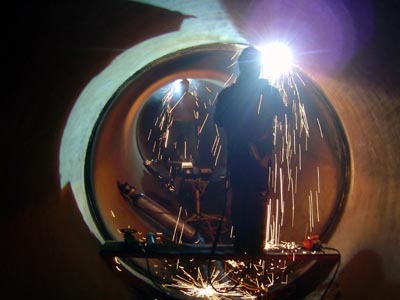 The project is rehabilitating approximately 22,800 feet of 66-inch and 69-inch diameter pipe. Construction crews are conducting most of the work underground, inside the pipe. 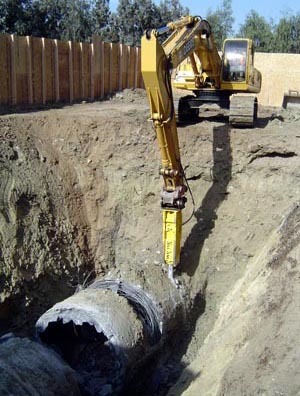 They access the pipe by excavating, establishing, and entering the pipeline through access sites, or portals. Most construction activities occur at the portals, which are spaced approximately 525 to 2,500 feet apart. 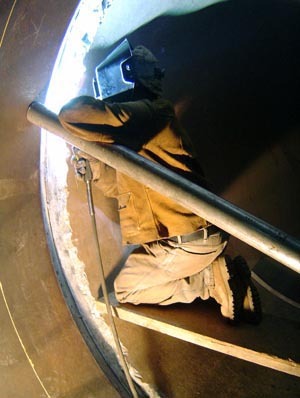 Portals 4, 6, 7, 9, and 11 have been repurposed to serve primarily as pipeline access and staging areas for construction equipment and materials. 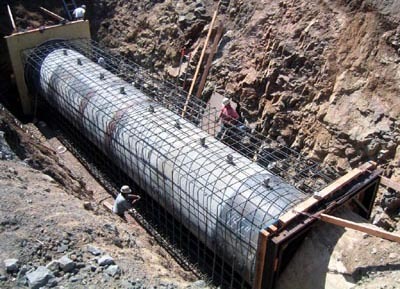 Existing pipeline access structures are also being rehabilitated and some flow control facilities abandoned as part of the project. The portals are 25-foot-by-60-foot excavated areas. Much of the construction work associated with the project is located within public street rights-of-way, where the existing pipeline is located. Lane closures are necessary in roadways along portions of the alignment during construction. Work at a limited number of locations may be conducted during nighttime hours to minimize impacts to the community. Where portals are located in the vicinity of residences, large wooden sound walls have been temporarily placed to ease noise impacts to residents. 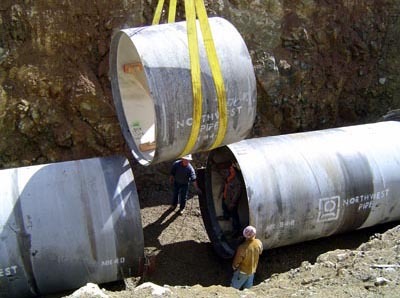 Upon completion of this project, the Water Authority will have rehabilitated approximately over half of the existing 82.5 miles of Pre-Stressed Concrete Cylinder Pipe (PCCP). 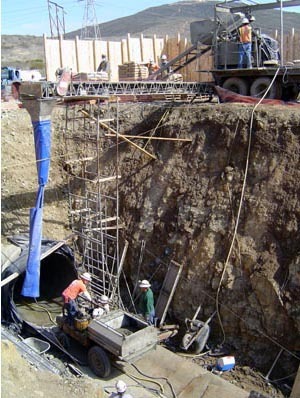 For information on PCCP and the Water Authority’s relining program, please visit http://www.sdcwa.org/pipeline-relining. Click the map to go to an interactive map to view work locations. 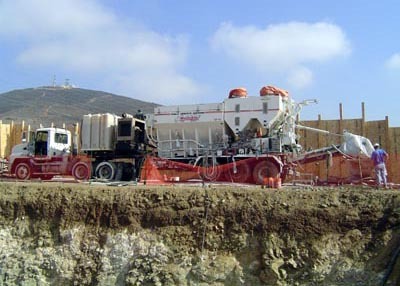 Pipeline relining is conducted in several phases. Primary construction activities will occur at access portals, which will be spaced approximately 525 to 2,500 feet apart. 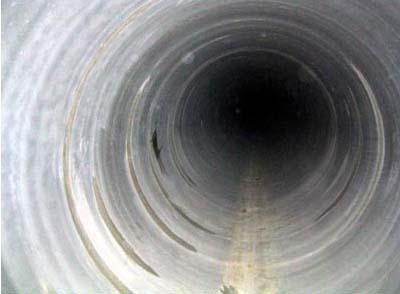 The portals are developed by removing 40 feet of existing pipe to gain access to the interior of the pipeline and install relining materials. Not all portals are active at the same time. Work will shift from one portal to another depending on which phase is under way. 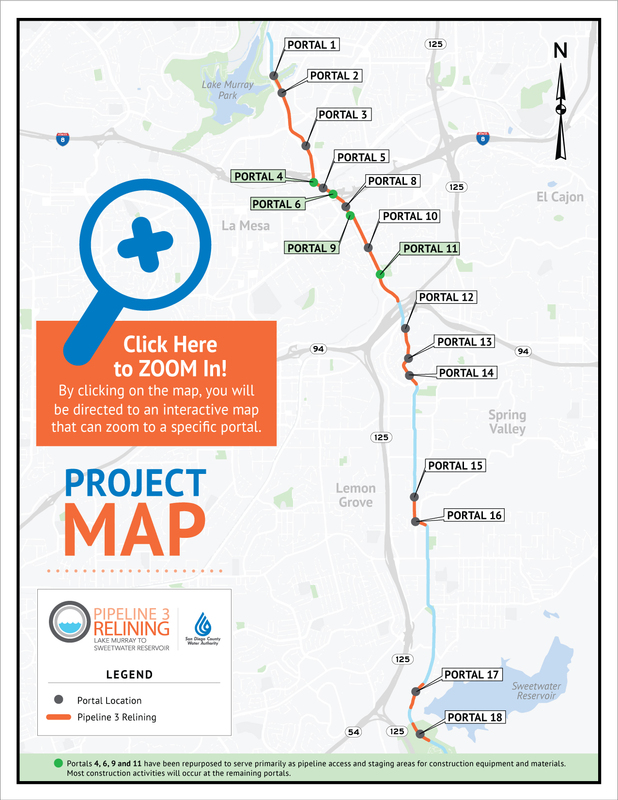 Much of the construction work associated with the project will be located within public street rights-of-way in the city of La Mesa, underneath Baltimore Drive (south of the Laport Street-El Paso Street intersection), Nebo Drive (to University Avenue), and Spring Street. Work will extend to some unincorporated areas south of the city. Some portals within the unincorporated portion of the alignment will be located outside of roadways in undeveloped areas. Click the portal numbers below to open a pdf map of the location for that portal. On Tuesday, May 16, 2017, neighbors may have noticed Water Authority and other passenger vehicles visiting Water Authority structures and planned project sites. The vehicles spent approximately 10 minutes at each location. This was part of a pre-bid site visit for potential contractors interested in bidding and working on the project. This was NOT the beginning of construction work, which is scheduled to begin this fall.